The image left in this message post represents what many users in the private chat room were able to see via screen sharing...I took a quick screenshot while in screen sharing with other members for marketing purposes, for my own private trade journal documentation (other two monitors not shown for security reasons) and for verification that I traded on that specific trading day I posted real-time trades & WRB Analysis in the chat room for those that were not in the chat room or not allowed in the screen sharing for whatever reason with others that were allowed. The trade story for that image on December 18th 2006 is not the profit of $1400 dollars. The story involves the missed VTR trade signals that would have resulted in a profit of +10k trading day along with problems in my documentation of my chart configuration on my monitors. Thus, I want to highlight the importance of maintaining a trade documents more that just a daily broker statement. In 2006 I thought my documentation was good enough...simple & easy. Yet, in comparison to what I do today in my trade journal...my documentation back in 2006 was a joke and I often had missed trade signals like that of December 18th 2006 because of my poor documentation prior to 2006 didn't prepare me for changes in volatility that impact my analysis & trade decisions of the trading day. Simply, I would soon learn in 2007 (after trading days like that on December 18th 2006) that my chart configurations can not be static (the exact same) throughout the trading day as if the markets or volatility never changed. For example, the image above/left shows exactly what my main monitor looked like but it doesn't show the other two monitors nor did I document them in my private trade journal. 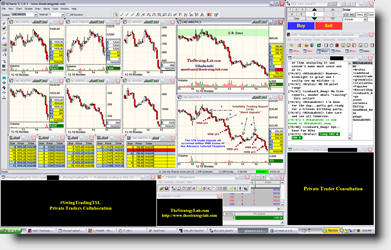 Those missing two monitors contained charts via FutureSource workstation of different key markets that helped me trade & understand the flow of the intraday price action. All that missing info not being documented was the primary reason why I consistently missed profitable trade signals on trend days or big swing point days. Today, in contrast, I've learned to document all my monitors in my private trade journal because my chart configurations change throughout the trading day as volatility changes but I only pull one image from my laptop (broker PnL statement without the charts) for use in the public trade journal. Yet, I do share my chart configurations with fee-base clients. In addition, I make sure I document the quantitative statistical analysis of WRB Analysis for each trading day with hourly market context info from my news sources because it impacts my position size management from trade to trade. Position size management is a critical aspect to my trading profits and I don't follow the herd nor any traditional way of deciding my position size for a particular trade. This info, why & when I change position size is not shared directly in the Volatility Trading Report (VTR) for security reasons just in case someone decides to violate my copyright protection. Instead, I only share position size management with fee-base clients that ask about such in clients private threads, private message in the chat room, skype or during screen sharing while trading. I now document on the chart with the location of the critical trade signals as the chart configuration looked like at the time of the missed trade signal because charts often look different in real time in comparison to at the end of the trading day in hindsight when we download/document/post charts that are typically mazimized in size. Using maximize charts for explanations is a flaw of hindsight analysis because they don't represent the chart configuration on our monitors when the trade signals occurred. In addition, I document the WRB profit target 1, reason for the missed trade and the name of the trade signal from the Volatility Trading Report (VTR) with reasons why I missed the trade. In addition, I now document the chart configurations for each trade, personal issues during my trading day, rest periods during the trading day especially when I walk away from the computer and other info that makes it look more like a diary instead of a trade journal. This type of documentation motivates me and helps me to be more prepared for the next trading day (mentally). Just as importantly, I'm able to adapt to change market conditions because I have the history via documentating my trading to keep me consistently profitable. If you as as a fee-base client were to ask about the missed trade signals or any trade I've take...I always explain in great detail the name of the trade signal strategy that you will have access too and any psychological reasons/chart configurations that impacted that specific trade decision. Yet, most of the time, the questions are asked in the private VTR chat room (not the free chat room) during the trading session and the explanations are clear...clients often say the explanations about the missed trades are a gold mine of knowledge...worth more than the value of the Volatility Trading Report (VTR) itself. The VTR is not mentoring but you'll at least learn my trade strategies and the reasons why I don't trade via one chart only along with how position size mangement with risk management will impact your trade performance. Volatility Trading Report (VTR) - Your payment of $473 will give you access to the VTR trade signal strategies, STR trade signal strategies, APAOR trade signal strategies, AJCTR trade signal strategies, Directional Creeper Movement (DCM) Analysis & Trade Signal, FVB trade signal strategies, WRB Analysis Tutorial Chapters 4 - 12 (advance price action only) and the #VolatilityTradingTSL real-time private chat room. The private chat room is where discussions occur about chart configurations, position size management & risk management along with what you should be documenting for the trading day. Also, if you qualify for screen sharing...you'll be able to see real trades executed in the broker trade execution platform and then see the same trades posted in real time in the free chat room. Note: Screen Sharing is not part of the VTR service. Its available to anyone that qualifies for access. If you cannot see the above payment image...click here. If you prefer to pay in Canadian dollars instead of in U.S. dollars (above link)...click here. Disclaimer: Today's trading performance is not an indication of my future performance and not an indication of the future performance for any trader that decides to learn/apply WRB Analysis. The risk of loss can be substantial. Therefore, you must carefully consider if trading is suitable for you within the context of your financial condition. TheStrategyLab.com is an educational and research site. The resources on this site are provided for informational purposes only and should not be used to replace professional educational and professional research because we are retail traders only. TheStrategyLab does not accept liability for your use of the website and its resources. We make no guarantees of success and your level of success is dependent upon other factors including your skill as a trader, knowledge, financial condition, market conditions and other factors. Trading is stressful and you should always consult a doctor in all matters relating to physical and mental health of you and your family because trading can impact beyond your financial condition regardless if you're a profitable or losing trader.